Posh chairman Daragh MacAnthony has come under fire from celebrity fan Adrian Durham. High-profile Peterborough United fan Adrian Durham has accused club chairman Darragh MacAnthony of ‘manager-selection bingo’ following the sacking of Graham Westley on Saturday night (April 23). The talkSPORT presenter wrote a blog on his employer’s website which was critical of MacAnthony’s ‘hire-em, fire-em’ habit. Former Posh managers Darren Ferguson (left) and Graham Westley. Durham, who pays for two season tickets at Posh every season despite work commitments often keeping him away from games, is a personal friend of Westley, but insists he’s not unhappy he’s left the ABAX Stadium. His comments prompted a Twitter spat with MacAnthony yesterday afternoon (April 24). Here is the article that caused the argument. Durham wrote: ‘Heard the one about the professional football club who had a succession of managers that lasted on average six months in the job before being sacked? Except for the one manager given time to be successful, and he ended up being sacked twice! ‘Welcome to Peterborough United, the club with potentially the greatest chairman in the world. But he keeps selling players, and keeps sacking managers, and then wonders why we’re mid-table in League One. The answer? Sack another manager of course. ‘I love the chairman. In his own way he loves me too I’m sure. But it’s time for some home truths. And before any clowns get carried away, no I don’t want MacAnthony to sell the club and leave. I do want him to start making some smart decisions. 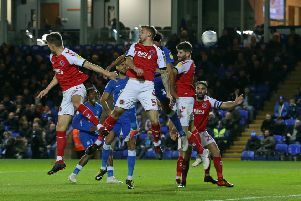 ‘When Graham Westley was surprisingly given the job as Peterborough United manager back in September I offered him one piece of advice – keep it simple. ‘Unfortunately he didn’t do that. The most obvious example of this was team selection, which became random and unpredictable to the point of farce. The Posh fans called it team selection bingo. ‘The chairman Darragh MacAnthony has a long-term version of the same game – manager-selection bingo. His hire and fire policy is completely incompatible with his transfer policy, and so young, hungry players come in, the manager works with them, these players rarely hit the ground running, and when results reflect that, the manager is fired. And the next one comes in and the cycle of success, failure, SACKED continues. It’s never boring, but it’s also never going to work. ‘Westley was absolutely a victim of the chairman’s over-emotional governance, and is there any wonder lower league managers struggle to make the grade when they are cut so little slack. ‘Let’s go back a couple of seasons: Darren Ferguson suffered a cruel relegation from the Championship with 54 points in 2013. It was a freak (MK Dons will go down with 40 if they’re lucky this season), and Ferguson was asked to pick up the squad and himself and get promotion straight back. George Boyd had been sold in the middle of the survival fight (seems insane in hindsight, but it happened), Dwight Gayle was sold that summer, and Lee Tomlin left soon afterwards. All three went on to play in the Premier League, but that quality was never replaced. In 2013-14 Ferguson won the Johnstone’s Paint Trophy and made the League One play-offs but couldn’t win them. ‘Days before the following season started goal machine Britt Assombalonga was sold. The chairman might as well have chopped Fergie’s hands off. How could he do his job? Posh failed to compete, Ferguson was sacked. You see the pattern? ‘After a spell in caretaker charge the youth chief Dave Robertson got the job permanently. He lasted a month of the new season before MacAnthony fired him. ‘As a fan, I wanted Steve Evans. But Westley flew himself to the chairman’s place in Florida, seduced him and got the job. ‘I’ll declare an interest here – I have known Westley for a number of years and we get on very well. My opinion of his management is something completely different. I’ve known Gary Johnson for much longer than Westley, but I was absolutely in agreement when McAnthony fired Johnson in 2011. Gary and I still get on very well. Oh and guess what, Johnson lasted seven months at Posh – same as Westley. Point is, I can easily separate personal interest from managerial ability. Unlike some. I’m not upset Westley has gone. I am wondering what the long-term strategy is at my club when it comes to managers. It all seems so knee-jerk right now. ‘Anyway, for four months under Westley MY Peterborough United returned: great football, lots of goals, good results and from looking like dead certs for a relegation battle we went charging up the table into the play-off places. The key was a goalscorer: Westley turned our impotent striker Conor Washington into a net bulger – any Posh fan will tell you it was a stunning transformation nobody had seen coming. I bought tickets for the FA Cup tie with Luton in December for the whole family, and we witnessed one of the finest Posh performances I’ve ever seen. It was total football, chances galore, and a victory to go with it. ‘But then the chairman sold Washington in January. QPR offered a ridiculously good deal that could not be refused – I understand that. But by accepting the money, the chairman had to also accept the consequences of losing such a crucial player. Not a one man team, but one man the team couldn’t do without. ‘Westley came in, the chairman wanted a quick fix and Westley delivered massively. With £2.5m on the table, for a player worth next to nothing in September, the chairman took the money. But he then expected the miracles to continue. Real life doesn’t work like that. ‘Young, hungry players were signed as replacements, but only a fool would think they would hit the ground running. Results nose-dived, as did the league position. I could mention some key players out injured, but a lot of teams suffer from that. I could also mention Jack Collison’s sad retirement because of injury, but again these things happen. ‘In desperate attempts to sort it out, Westley’s team selections became a sitcom, performances the biggest joke, and when you’re losing there’s no way out. ‘In isolation those things get a manager the sack. In context the sacking will make many coaches wonder if going for the Peterborough job is a quick way to ruining your reputation and ending any hopes of a managerial career. ‘Westley inherited someone else’s losing squad, turned them into winners, had his main goalscorer taken away, and struggled to work another miracle. As fans we had four months of brilliant football, then three months of nonsense, and the sack. It might make sense to some, but Westley left Posh in a higher position than when he arrived, and he made the club £2.5m in January. He didn’t even get a pre-season. Hell, we’re not even getting relegated this season. The manager circus is giving the chairman a reputation. ‘I love the passion of Darragh McAnthony: outsiders beg him on Twitter to go to their club, people lost in a brainless world where they think they will never disagree with anything he does. ‘He’s overseen some great times at Posh, no question about that. And I respect that he cares so much, and that he has always paid bills and wages on time – that’s how a club should be run. ‘But if I tell you the chairman set up face-to-face meetings yesterday. He’s disarmed those wavering, and they will now be charmed into purchasing of course. ‘Clever from the chairman, and the collateral damage will soon be forgotten. What mustn’t be forgotten is that Darragh MacAnthony appointed Westley, but didn’t have the balls to back his own decision-making. And this is becoming a damaging habit. Since the chairman arrived at the club, apart from Darren Ferguson, none of the other six managers he’s had have lasted more than seven months, and that doesn’t include caretakers. ‘Clubs need stability, but that can only come if the chairmen are clever enough to make good decisions. Appointing the right manager is crucial, as well as accepting the consequences of a selling policy. My message to the chairman is simple: make an educated low risk decision on the manager, let him get on with it, give him time, and don’t undermine him by selling players – especially mid-season. ‘He’s good company Darragh McAnthony, but his chat is sharper than his decision-making sometimes. And he’s started worrying too much about some of the stuff morons on social media bark at him. I have absolutely no doubt he will fall out with me over this article. He might even choose to use it as some way out of the club. Let me be clear – I absolutely don’t want him to leave the club.